This scene shows Jesus 'dead' upon the cross after his horrific crucifixion ordered by Pontius Pilate on behalf of the angered Jews. The scene depicts the soldiers about to remove the dead bodies from the crosses. Traditionally, those who were sentenced to die upon the cross were rebels, low criminals or slaves from Roman society. They would endure a horrible ordeal; being beaten, flogged and tortured before being hung on the cross. Depending on the physical state of the accused they would usually die during the early stages and would not make it to the cross. Those still alive would have to endure the crucifixion, eventually dying from dehydration and asphyxiation. Christ on the Cross shows the Roman soldiers checking whether or not the hangers were dead. On seeing that Jesus had passed away the centurion Gaius Cassius Longinus said it was not necessary to break his legs. To prove this he pierced his lance Jesus's side which caused blood and water to seep out. It was known that the centurion Longinus was partially blind but he actually suffered form xeropthalmia, a vitamin C deficiency. After piercing Christ, Longinus' eyesight was cured as the blood and lymph water fell into his eyes and he exclaimed, "This is indeed the Son of God!" (Mark 15:39). On being cured, Longinus converted to Christianity and became a monk. Taking up a new faith and studying under the Apostles, Longinus ran into trouble with the law in Rome. He was captured and had his teeth pulled out and they cut off his tongue for spreading the Word of God. Despite this it was reported that Longinus could still speak clearly. 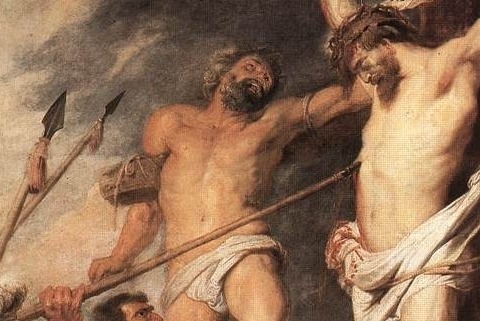 The subjects here are the dead Christ, the two thieves on either side of him and Longinus. Below Christ is a very blonde Mary Magdalene who holds up her hands in protest as Longinus is about to pierce the body. She tries to encourage respect for Christ's dead body. Christ's mother Mary is seen to the right wearing a black cape and the traditional blues. She is depicted in utter torment for what the soldier is about to do to her son and therefore turns her head away, unable to look. To Mary's left, in red, is St. John who also looks away in pain for his friend's body. Behind the Virgin Mary is Mary the wife of Cleophas who clasps her hand in prayer as she looks to Christ. 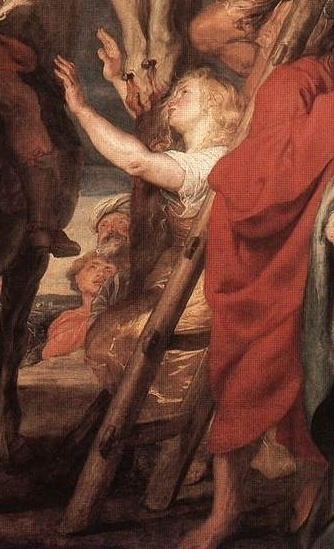 Mary Magdalene is shown with her arms around the cross as it's argued that Rubens wanted to depict Magdalene's head near Christ's feet as she symbolizes her role of repentance by kissing his feet. The hanging thief on the right contorts his body as his legs are smashed by the soldier's iron bar and he rips his foot out from the nail. The other thief to the left looks on sadly in the direction of Christ's dead body as the soldiers look to kill them off.